Good Morning! Do you remember the ornaments I made the other day? No, I haven't improved on them but I did create some great packaging. 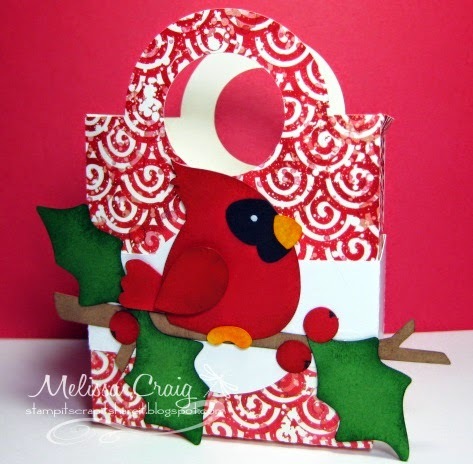 Kelleigh Ratlaff Designs created these wonderful gable boxes just for these types of ornaments. Cute huh!? I love these little boxes. 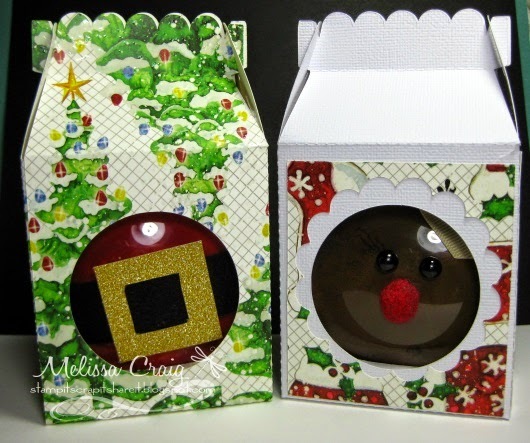 You could ungroup and remove the center cut outs if you needed a cute little box for other gift giving. Hello - thank you for coming by. 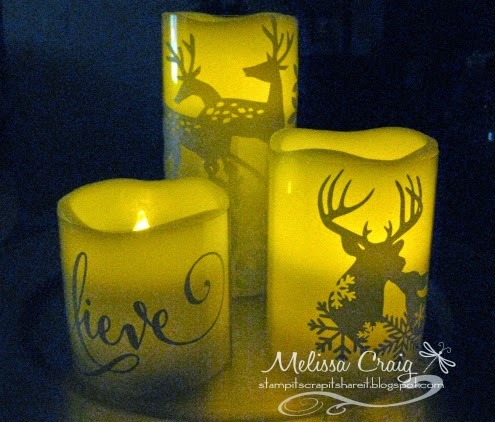 Today's project is featuring those really cool electronic candles. I have to admit, the only ones I had ever paid any attention to were the little tealights. But I saw these pillar candles on tv and thought they were pretty neat, but pretty expensive. But the commercial that I saw for them also came with these transparent sheets to decorate the candles and I thought I could do that, too. I found these pillars at Michaels and they were on sale plus I had a coupon that I could use on sale items, too, so they were way inexpensive. 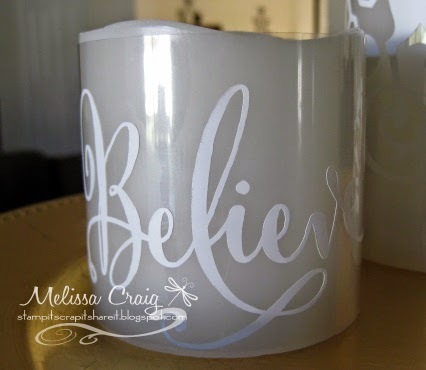 I found some great files on the Silhouette Online store that helped me with my idea. I cut the images using my Cameo and white vinyl. I measured the protective sheet that was already wrapped around the candles (but desperately ugly) and then cut clean transparency. I then cut a piece of scratch paper the same length, which ended being something like 10 5/8" and wasn't about to figure out with measurements what the middle was. So I folded it in half and marked up the crease with black marker. Then smooth that flat to place the piece of transparency and added the cut piece eye-balling the center of the image. 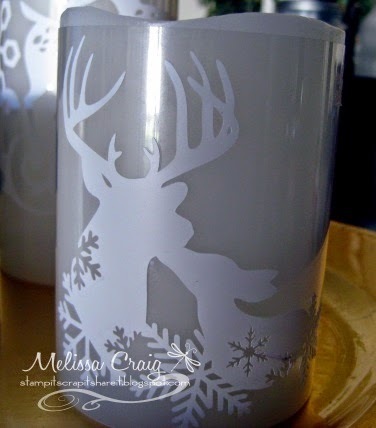 Then just wrap the transparency around the candle and tape it in the back. 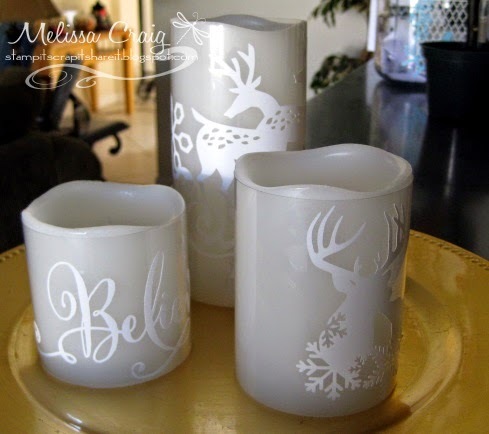 I can dress these candles up all year to fit the occasion or season! Very inexpensively, too. Hello there! I am so glad this week is going by so quickly, the faster it goes the more I can share with you and I won't have to contain all my excitement. Today's project isn't how I originally intended but super cute anyway. I was planning on turning this into a flower arrangement and am still going to since the kids sort of swiped the candy after the photo was taken. I did not have the easiest time taking this picture. But you get the idea. 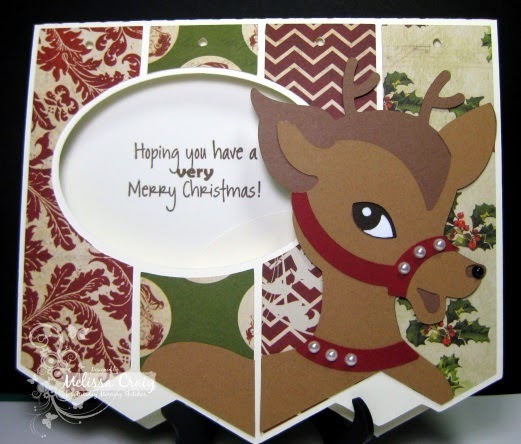 The Santa's Sleigh is by Lori Whitlock available in the Silhouette Online Store and Lori Whitlock dot com. This is cut file is sooo easy to put together. 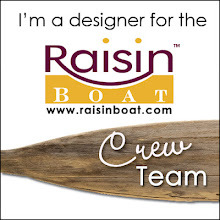 I cut the base out of Red Delicious card stock by Raisin Boat. The trim pieces and sleigh blades I cut from gray card stock and then covered them in silver embossing powder. Then filled with candy. I think for my friend, I'm going to make that flower arrangement and add a wreath to the front. Thank you for stopping by. Have a great day. Hello! I have been making some super awesome projects to share for the next 12 days. This one I actually made weeks ago and I can't believe I can finally share it with you! 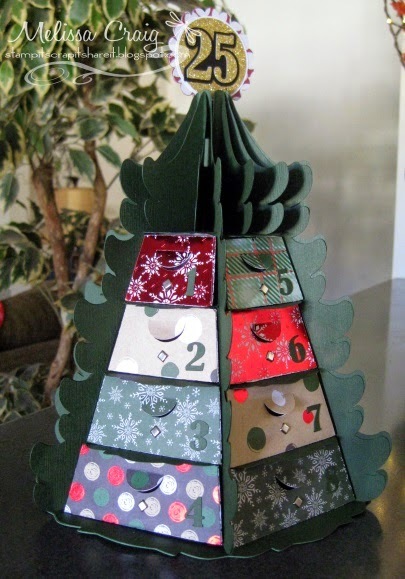 This is the Christmas Countdown Tree available at the Silhouette Online store or SVG Attic, designed by Jodi G Warner. 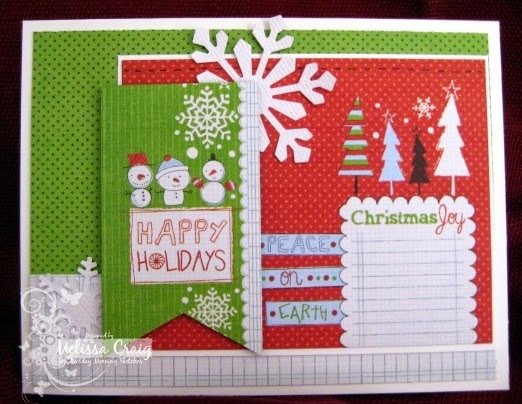 The papers I used are Bazzil cardstock for the base and Holiday Lodge collection by Recollections. The tree was a little tricky to put together, if you look close, you'll see I'm off just a little. But it wasn't hard and it took a day to do it. Love how it turned out. It's not too late to make this. You could even double up on dates so perhaps two people can share the tree. Thank you for stopping by. Please leave me a comment, say hello. Hello and welcome to my last day of Snowman Week. It's been a lot of fun! 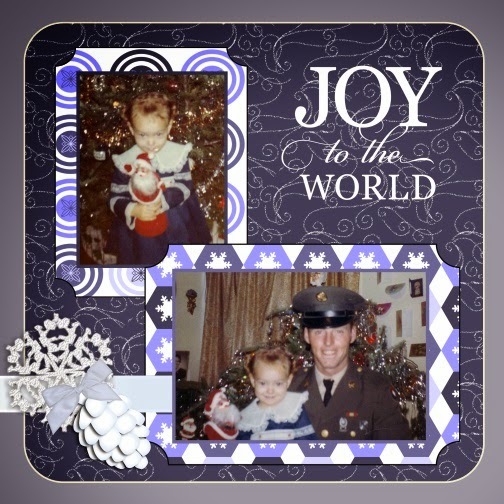 I am looking forward to sharing 12 days of Christmas with you, too. Featuring more cards and projects. Hopefully I can help you with a gift or two. 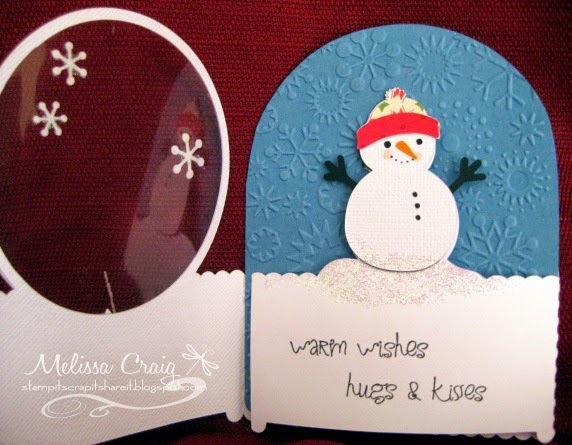 This week's project is a file by Samantha Walker, owner of Digi Playground and this has to be one of the cutest, easiest snowglobe cards to put together. I did get the file from Silhouette Online store. Cute, right? I love how this turned out. 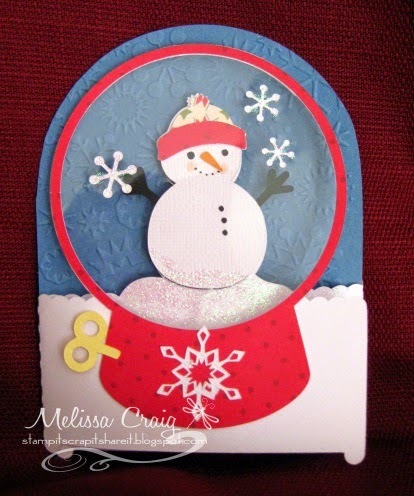 I did emboss the blue background with snowflakes embossing folder. I also cut the window sheet (actually it's an overhead projector transparency from the office supply store) with the Cameo and it worked pretty well. A word of caution... be very careful peeling it off the mat, if there is a little section that didn't cut completely, it will tear. Look closely, you'll see what I mean. Here's the inside of the card with a simple greeting stamped inside. You could open this flap, too, for your personal message. Thank you sharing my Snowman Week with me. I certainly had a great time. 12 Days of Christmas begins December 9th and will run everyday to December 20th (where I hope to feature my biggest project yet!). See you then. Hi again! Welcome to day 4 of Snowman Week. I'm so sad, this week is almost over. 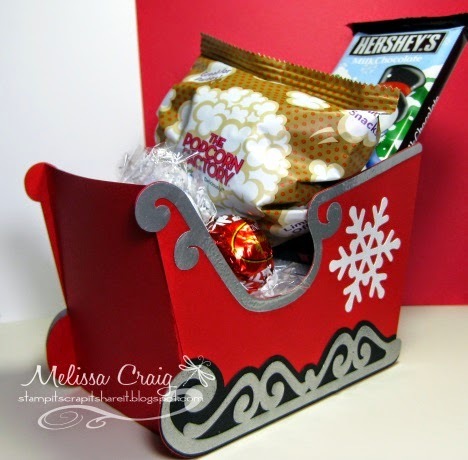 Today's project share is a super cute gift box that can loaded with cookies, a coffee bag or some other yummy treat. 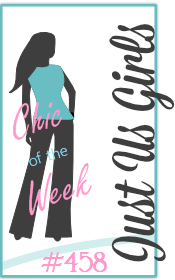 This is a cut file by another favorite svg artist, Jamie Lane Designs. This particular file I got from the Silhouette Online store, but Jamie also has her most recent files here at Digi Playground. In hind sight, I really should've gone with a bolder color for his scarf. I liked the pattern in this paper so I thought it would be cute and it is... it's just too light for the photograph. But look at that face! There are window sheets in his belly but you could probably remove these before cutting if you prefer a more solid piece. 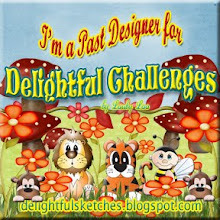 By the way, I wanted to mention that I am not part of a design team for Lori Whitlock, Snapdragon Snippets, Jamie Lane Designs or Silhouette. These are just my favorite places to shop and artists I love. Shoot! I can only wish they'd let me be on their design teams. Hello! It's day 3. 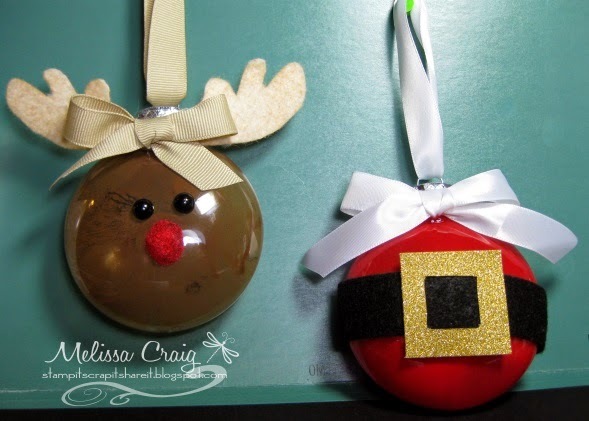 I have a fun little project to share with you today featuring vinyl and clear plastic ornaments from Michaels. Talk about easy!! 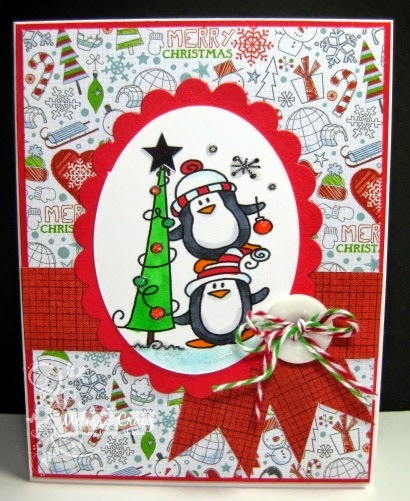 My project features a cut file by Snapdragon Snippets called Flourished Snowman. I found it in the Silhouette Online store, I couldn't find it in their store to link to it. I cut the image from white vinyl. Before adhering to the ornament I cleaned it really well with some damp paper towel. I would not recommend using transfer tape for this. 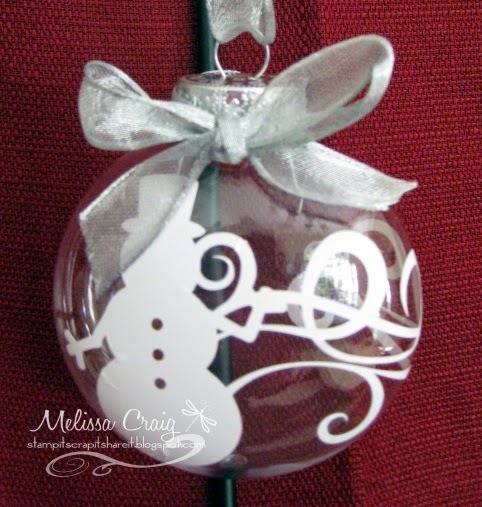 Take your time when placing it onto your ornament and just allow the design to lay where it flows naturally. You will need to make tiny splices here and there to ensure it lays down onto the surface or you'll have bubbles. 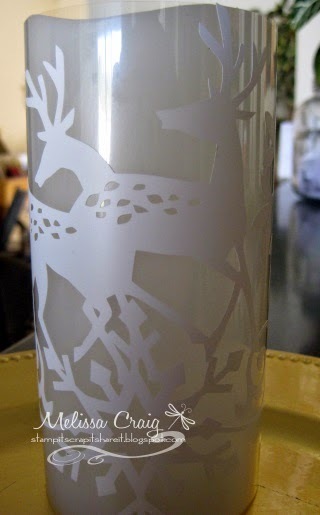 I then finished it with a bit of silver ribbon. My son suggested putting "snow" on the inside and it's a great suggestion, I just couldn't find any. See you tomorrow. Thank you for stopping by. Please leave me a comment so I know you were here. Good Morning! Happy Tuesday! The sketch is up at Tuesday Morning Sketches and this is another good one by Jessi. 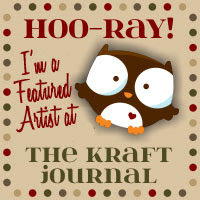 Our sponsor this week is Craft Classes Online. It's also day 2 of my Snowman Week, so I incorporated it with Tuesday Morning Sketches. I actually made a card that has zero stamping (digi or otherwise), zero cut files. My card is nothing but decorative paper. Festivus by Recollections. 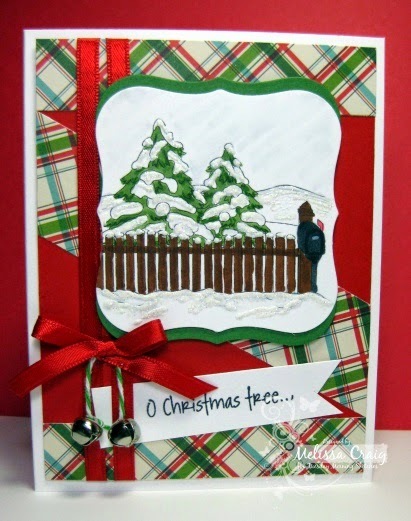 Has anyone ever created a card with just decorative paper? This was my first time. It was so quick and so easy! 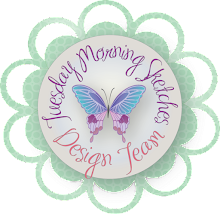 Head on over to Tuesday Morning Sketches and join us! It'll be fun! Hello! Welcome to my blog. I am so excited about this week. For a couple of years now, I have done a special week dedicated to the snowman. I love them! Mine are dressed up for the Christmas holiday, but change their look and they're perfect for the winter season. Day 1 Project is Snowman Soup. Who doesn't love a hot, steamy mug of hot chocolate when it's a bit chilly outside. Even those of us in Florida get a few chilly days to enjoy hot chocolate. 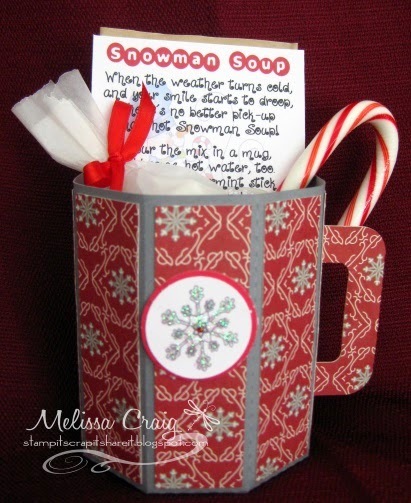 The mug is a fun cut file by Lori Whitlock: 3D Hot Cocoa Coffee Mug and digi stamps by Deedee's Digis Snowman Soup. And if you hurry, you can grab Snowman Soup at 50% off and today is the last day for Deedee's Digis Customer Appreciation sale. But if you miss it, it's a bargain at full price. Where is the snowman? I'm so glad you asked! I couldn't get a photo that was good enough, but if you look closely at the hot chocolate packet, you see the snowman soup poem. The snowman is a "watermark image" behind the poem. Thank you for stopping by and I hope you'll come back. 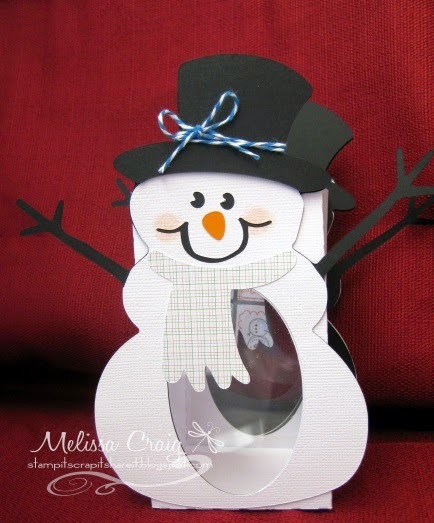 Snowman week will run through Friday and I'm getting ready for my 12 days of Christmas, too!